Middle Grade Ninja: The Ninja Won the Pot-O-Gold Award! The Ninja Won the Pot-O-Gold Award! 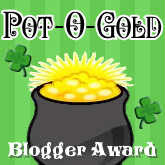 "The Pot-O-Gold Blogger Award is awarded monthly, by me, to one blogger who I feel has a flair for interesting and helpful content, as well as visually appealing and easy-to-navigate design. In other words, it's like discovering a pot of gold! It's a site you will visit frequently and enjoy swimming around in for a while." 1. Say thank you to the person who gave it to you. FAITH: I'm a writer. I have to exercise faith each and every time I sit down to write that someone, somewhere will want to read what I'm writing. HOPE: I hope last night's final episode of Big Love was just a bad dream I had and that when I watch the real final episode it will have a better ending. LOVE: I love Mrs. Ninja. Obviously. And Batman. And you, Esteemed Reader. LUCK: I feel lucky because I have even more exciting interviews with authors and literary agents to share with you in the coming weeks. Now then, I guess I'm supposed to choose four bloggers to give this award to. Hmmmm. Well, obviously I follow several writer blogs, so I'll just rule out the blogs of any authors or agents who have appeared here. I couldn't possibly choose among so many fine blogs and in a way, isn't having appeared on this blog award enough? No, I suppose not. Also, my first choice would be Casey McCormick and Natalie Agguire, but I can't very well regift Casey's award back to her. BabylonSista at Confessions of a Cybernegress because I'm married to her:) You may note her most recent post is about a delicious beet recipe. Beets I ate. What's not to like? Melina at Reading Vacation because she reviews way more books than I do and her love of reading inspires my own. Bruce at Building Batman. I have never commented on this blog nor reached out to Bruce in any way. But I do love reading about his mission to become Batman and I support this noble cause with all my heart. Great award! I hadn't heard of this one. It really explores you the writer from a different angle. Congrats!! You're welcome, Rob. Great choices for passing the award on!! And that video is awesome!! Hahaha I hope he made a lot of money. Congrats Rob. Your awards were great, especially to your wife. WTG on the award and thank you for sharing. Wow! I've been Spring Breaking so haven't been around the blogs lately. What do I see, the very week of my birthday, but this nice award from you! Thank you so much. Too bad it's not regiftable, or it would be right back at you! Hope all is well with your writing. Wonderful video...You have done great job..